The Sci-Fi Chronicles book just keeps paying off, I’m loving this incredibly large tome, and I can’t believe how quickly I’m working my way through it (admittedly I’ve seen, and reviewed a lot of the stuff before). 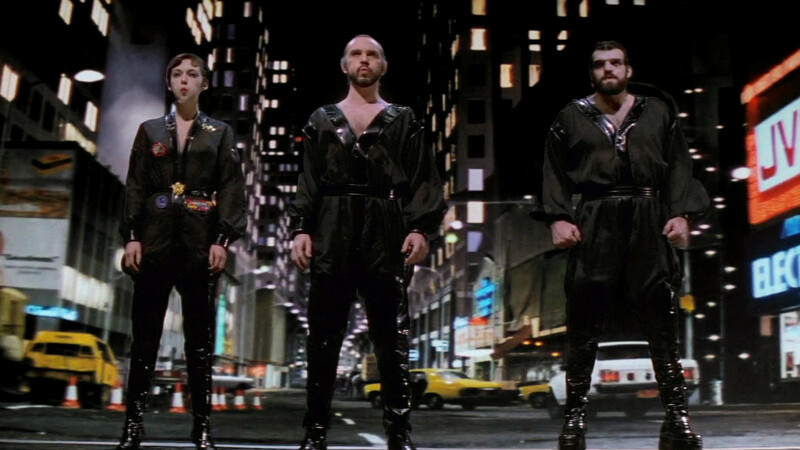 Having previously reviewed Superman: The Movie, I moved forward to the next title, Superman II. Now, I tend to prefer the Richard Donner version of this film, but I’m following a bit of a chronological path, for this book. And I hate to admit it, but this one does have some great lines that didn’t make into the other version (“Would you care to step outside?”). It also has some stupid things as well though, like the Superman (Christopher Reeve) shield being ripped off of his chest and thrown like a net, the invisibility game, and of course, the memory-wiping kiss (I prefer to think Lois just played along to keep his secret). Without Donner, there was no John Williams score, but Ken Thorne took over composing duties, but happily the series had the rights to the gorgeous and powerful themes that Williams had written. This one ends up being a light-hearted, colorful romp, with Gene Hackman’s Lex Luthor chewing any scenery he can sink his teeth into, and the nostalgia associated, on my behalf anyway, covers a lot of sins, and plot holes (for instance how can Zod and company breathe and talk on the surface of the moon, and where do the psychic powers and finger-pointing lasers come from?). While the story may not be the greatest, and the production may have been troubled, Reeve does look as if he’s very much enjoying playing both sides of the character. Clark and Lois are given an assignment, cover the swindling of newlyweds in Niagara Falls, and it sets up some nice time for the characters, especially as Lois digs into her suspicion that Clark is actually Superman. Once the truth is out, Clark admits he loves Lois and gives up his powers to be with her. but as Zod begins taking over everything, he realizes his role is bigger than just being a man, and must sacrifice his own happiness for the greater good. That’s heartbreaking and inspiring in a way, and it’s too bad it gets buried in everything that is happening in the film. Not a bad film, but still a little goofier than it needed to be… but Reeve and that fantastic theme by Williams makes up for a lot!